Article first published as TV Review: KILLING EVE on Seat42F. WARNING: Some relatively light spoilers contained within. 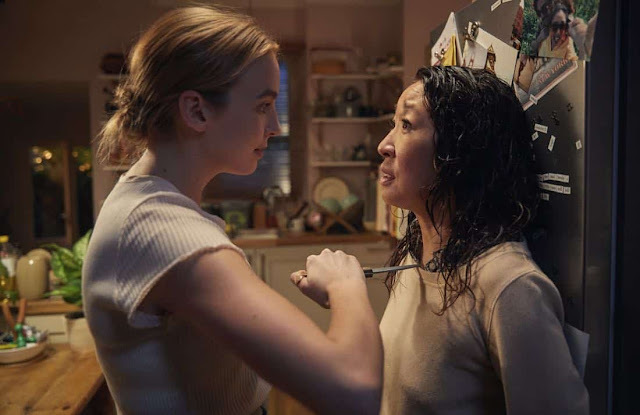 BBC America’s newest drama, premiering tonight, is KILLING EVE. Based on Luke Jennings’ Villanelle novellas, the series is essentially a cat-and-mouse game between a serial killer and a super smart intelligence agent. While that does sound a bit done-to-death as a premise, the lead performers, their individual personalities, and the dynamic between them, makes this one highly compelling and totally worth watching. With some great supporting characters, a few stereotypes tossed on their heads, and beautiful settings throughout Europe, it is one I can definitely recommend. KILLING EVE takes its time getting started. When we first meet Eve Polastri (Sandra Oh, Grey’s Anatomy), she is working as an assistant at MI-5. Although she is smart and obsessed with female serial killers, she doesn’t have much authority to investigate. When she raises solid, valid points to her superiors, they are quickly shot down. This obviously can’t be where she operates from for the course of the series, but it’s not until episode two where she really settles down into what will be her base of operations, in the role she needs to front this story. On the other hand, the hired assassin, Villanelle (Jodie Comer, Doctor Foster), is pretty much fully formed from the beginning. Traipsing across the continent towards whatever target she is sent to next, she enjoys her job and is very good at it. Villanelle isn’t the master of her destiny, but she acts like she is, rebelling when those who would direct her do things she doesn’t agree with. She is probably insane, definitely psychopathic, and also highly intelligent. I wouldn’t want her attention on me. The two women do cross paths directly early on, which is appreciated, rather than keeping them apart for a very long time, as one might expect the series to do. The scene is magnetic, and communicates much of what the rest of the season will surely be, layered with delicious, beautiful tension. While they really don’t start their personal game until the very end of the second hour, this meeting helps drive through all the set up, hooking viewers early on, rather than making them wait until the plot is fully formed. Comer and Oh are fantastic, and while they steal focus in every scene, they have plenty of help to build up the world. Kim Bodnia (The Bridge) manages to convey danger and threat while appearing not at all dangerous and threatening. David Haig (Penny Dreadful) plays the epitome of mentor, knowing what buttons to push to properly guide and motivate Eve, while also seeming like an every man, in a good way. Fiona Shaw (the Harry Potter films), always excellent, is terrifically understated here. Owen McDonnell (An Klondike) plays the supportive husband as more than just a trope, someone who both truly understands and doesn’t at all get his wife, Eve. Kirby Howell-Baptiste (Barry) is just plain fun at this point. Together, they effectively help sell the show. KILLING EVE is on BBC America, and I’d say it shares some DNA with one of the network’s best former series, Orphan Black. It has a similar dark tone, with a slightly offbeat story and a solid ensemble. Once again, it’s a magnetic female lead, two this time, that will be the number one reason to watch, while giving them a fleshed-out framework to be supported by. Other than that it once more involves law enforcement and a criminal, a conceit extremely overused on modern television, this is a really great series, and definitely one I want to continue watching. Thankfully, it’s already been renewed for a second season. KILLING EVE premieres tonight on BBC America.